These words are known as fossil words, because although they are no longer productive in the language – their creative capacity is not in fine fettle – they have been preserved in set phrases, idioms and contexts. Like physical fossils, they offer a glimpse of earlier times, throwing a light on language from days of yore. English has quite a few fossil words, testifying to the effectiveness of the expressions that have housed them from time immemorial. They don’t always monopolize the word in question: searching for immemorial we find other uses extant (e.g., “an immemorial philosophical problem”), but the fossilised use predominates. And it’s not just words that get fossilised: phrases and sentences do too, like if need be, come what may, and be that as it may. Lines such as “Till death do us part” and “Long live the Queen/King” also stand a good chance of long-term preservation because they are closely tied to ritual or tradition, while proverbs can last centuries by dint of their storing a piece of wisdom or common sense that applies to everyday situations. 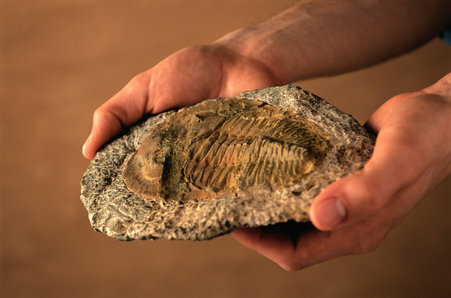 We all have a few fossils at our beck and call. “It had been a rough day, so when I walked into the party I was very chalant, despite my efforts to appear gruntled and consolate. I was furling my weildy umbrella for the coat check when I saw her standing alone in a corner. She was a descript person, a woman in a state of total array. Her hair was kempt, her clothing shevelled, and she moved in a gainly way. I wanted desperately to meet her, but I knew I’d have to make bones about it, since I was travelling cognito. ….” And so on. I have the full text but no exact details. Thanks for the reference. I was thinking too about your “hoist…petard” example – this kind of picking-apart of extremely fixed collocations is a great resource for humorists. Wodehouse does it a lot, e.g when B Wooster says “I decided to keep my lip stiff and upper”. I always thought that the phrase was “beckon call”, or “Beckoning call”, because that tended to make a little bit more sense in the context used. Does the verb “to beckon” come from the phrase, or is the phrase itself an old misspelling that has become common throughout the english language ? JJ: Beck came about by shortening beckon, centuries ago, so they’re closely tied by etymology. Beckon is a very old word in its own right, related to beacon. You’re not the only person to interpret beck and call as beckon call, as the Eggcorn Database shows. Petard comes from the French word peter – meaning to fart. To be hoisted by one’s own petard conjures up an amusing image. KJF: That’s true, and it does. As a child one of the words I used for it was the onomatopoeic bang, which I associate now more with non-biological kinds of explosion. “Short shrift” and “hoist by your own petard” were coined by Shakespeare as were many other apt phrases. If you’ve had “cold comfort” or “too much of a good thing”, if you refuse “to budge an inch” or if you are “tongue-tied”, “hoodwinked” or “in a pickle” you are quoting Shakespeare.The same applies if you are “a tower of strength”, “bloody-minded”, if you “lie low”or refer to say, a wind farm as an “eyesore”. Paul: Certainly Shakespeare was the first to put “short shrift” and “hoist by your own petard” (or rather a form of them) in writing. Though I wouldn’t go so far as to say that anyone using the phrases is quoting him. Stephen: Thanks very much for the link. I’ve downloaded your paper and look forward to reading it.